Those who seek to devastate their foes through an expertise in martial weaponry will find the Berserker to be an exciting profession. 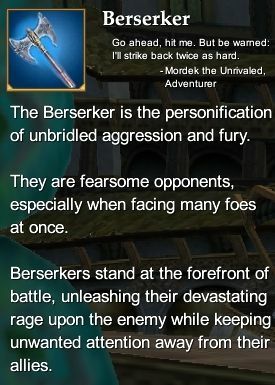 The Berserker's skills in melee combat consume the entirety of his role and abilities. The Berserker is the personification of unbridled rage and fury, making him a powerful combatant. The Berserker serves his party on the frontlines of battle where he can best vent his rage upon his enemies in melee combat. The Berserker shows neither mercy nor apprehension in combat. This page last modified 2011-08-25 22:55:19.